Innovation in construction happens all the time. However, one of the areas often overlooked is the foundation. Today, energy concerns are changing that. Now there are more choices available when building a new foundation. These choices reflect the fact that homes today can be built better, and homeowners want quality and value from new construction projects. • Building can be stressful. Are there better and more efficient ways to build? • What can be done today to help ensure our family doesn’t face foundation problems in the future? • Can we make our home safer? more efficiently and improve our home’s thermal continuity? • Can we reduce our utility bills? There are a number of solutions to these questions. 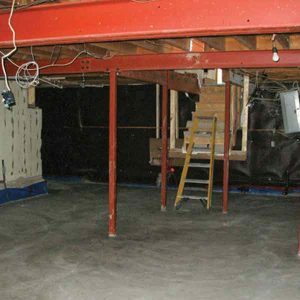 For new construction projects, Basement Specialist advises the use of Insulated Concrete Forming, or what is called “ICF”. 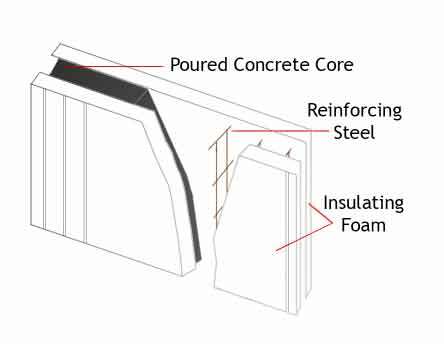 Insulated concrete forms are made of expanded polystyrene that provide the form for a cast-in place concrete core to be poured. Because the insulated forming is specially designed to become a part of the foundation itself, ICF can increase initial material costs by a little bit. The good news is, ICF is quick and easy to set up and provides built-in inner and outer insulation for your foundation wall. This saves on labour and insulating costs, making ICF projects as much as 50 per cent cheaper than traditional foundations overall. Likewise, using quality materials for quick and easy construction reduces stress. This allows even the most concerned homeowners to get excited about their ICF project. ICF also provides for easy to finish foundation walls. The outside walls will be waterproofed as normal, and the inside walls can be finished to meet any interior decorating specifications. 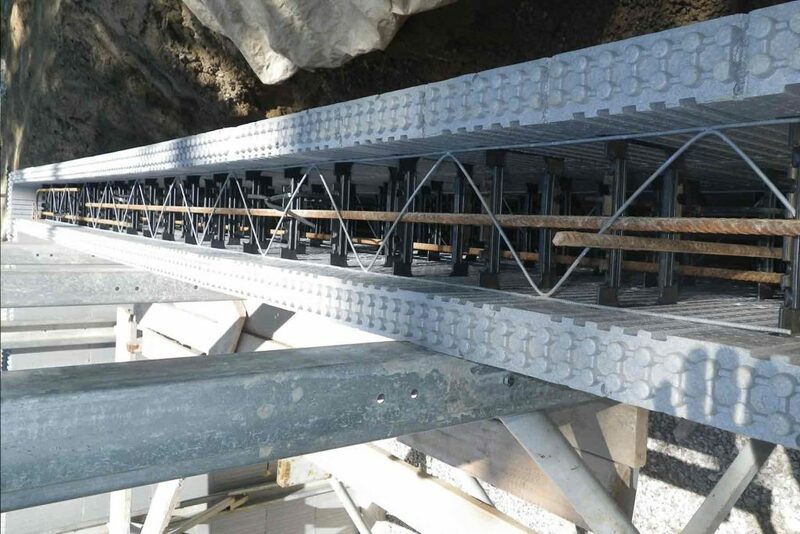 This makes ICF a simple solution for ensuring construction is done right the first time. In our experience, this protects homeowners from potentially costly moisture, water leakage and structure problems in the future. 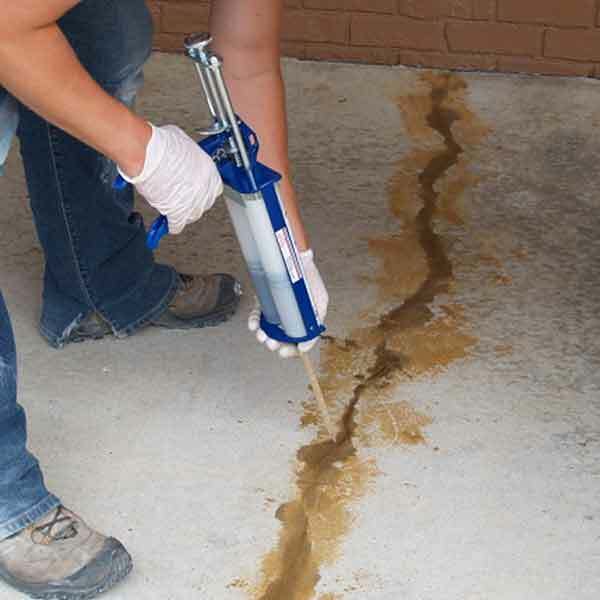 As well, health risks such as from soil gas or from mould and mildew are eliminated. Even more importantly, the dual insulation provided with an ICF foundation conserves energy and eliminates air leaks. 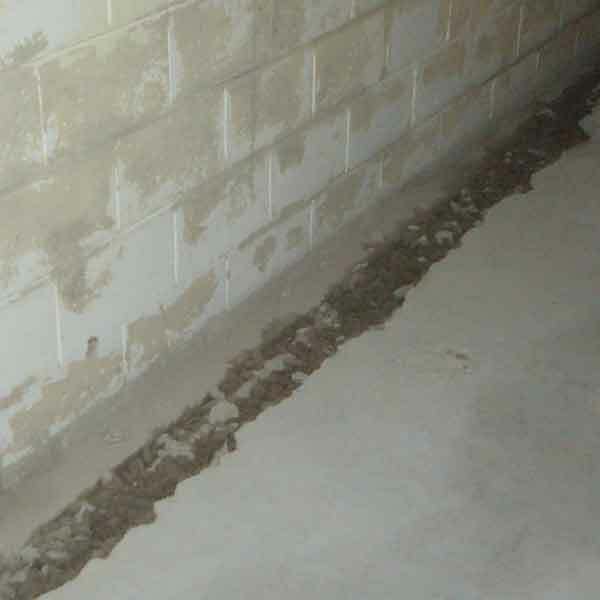 This creates warm, comfortable and fully usable basement space and provides thermal continuity in the home. It even makes first floor floors warmer. The insulation also stops your home from losing heat in the winter and coolness in the summer. 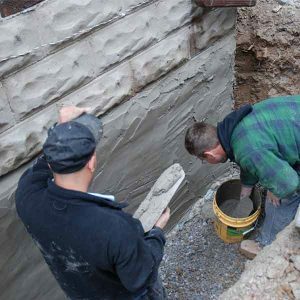 ICF foundations can save homeowners hundreds of dollars per year in utility costs. Homeowners may even be able to purchase smaller heating and cooling units. In fact, many ICF homes qualify for tax credits for energy efficiency. 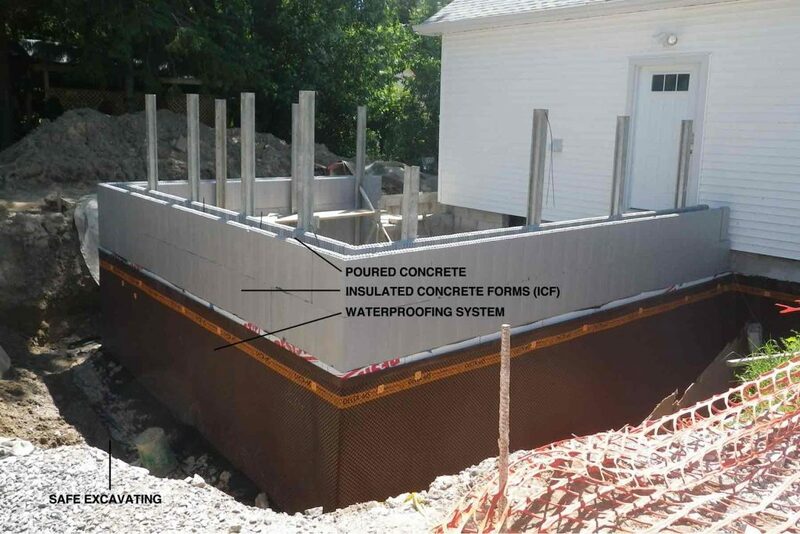 ICF can be used for both below grade foundation walls and above grade walls as well. 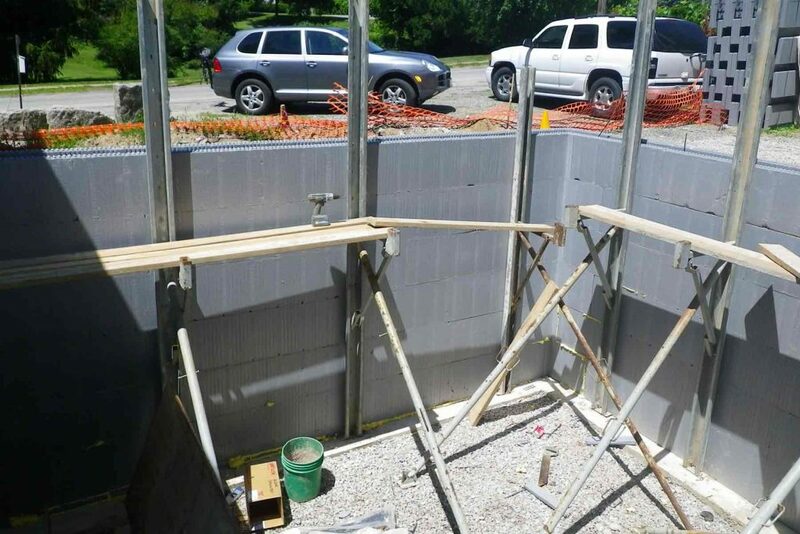 For example, the new Starbucks in Dundas used insulated concrete forms for the foundation and all above-grade walls, all the way from the basement to the roof! At Basement Specialist, we can build all different types of foundations. However, ICF is often the best choice for homeowners. As such, we are proud to be able to offer this choice to you for your new construction project. We are ICF certified and can answer any other questions you may have.